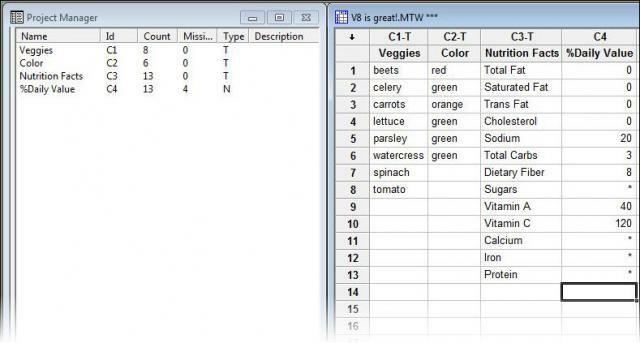 Has Your Minitab Had Its V8? Have you ever seen those commercials where people are walking at a slant because they haven't had their V8? I was reminded of these ads recently when I had the opportunity to visit one of our Minitab customers in Tampa, Fl. During the visit, I presented a seminar on some Advanced Minitab Tips and Tricks* using the same content we have presented in some of our free webinars. 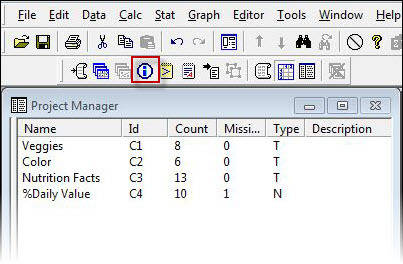 The first thing I always do when opening a new worksheet in Minitab is click the “Show Info” icon in the Project Manager toolbar. The “Show Info” button opens the Project Manager window to the left of my worksheet and gives me a nice overview of the data in the worksheet, including how much data is in each column and where I might have missing values. I can quickly see in the Project Manager screenshot below that all three of the columns in the worksheet I just opened have different lengths (Count = 8, 13, and 10). I can see in the Project Manager that my %Daily Value column is short of the Nutrition Facts column by three data points. If I want to analyze these two columns in the same graph, I will need to even them out. Note that the Type of data in the %Daily Value column is numeric. 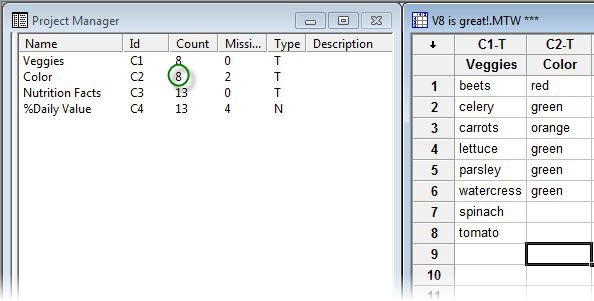 With this in mind, I can simply put an asterisk symbol in row 13 of the %Daily Value column and Minitab will automatically backfill the rows above with an asterisk (*). NOTE: Missing values in Minitab are denoted by the asterisk symbol. If you did not collect data for a certain point, enter the asterisk symbol…not a zero. Putting a zero in the place of a missing value will result in incorrect calculations for statistical calculations like means and standard deviations. 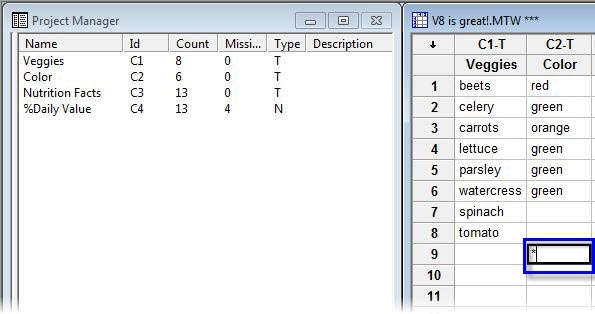 If I need to extend the number of data points Minitab recognizes in a column of text values, the procedure changes just slightly. Instead of putting the asterisk symbol in the last row you would like to have filled with data, put the asterisk symbol one cell lower. In the example below, I would put the asterisk symbol in row 9 of the Color column. Tab out of that cell once the asterisk is entered and you will see that the cells above remain blank but the asterisk symbol remains. Your column will also be one row too long. Delete the asterisk that you entered and that will bring your text column back in line! After I walked through this simple demonstration (within minutes of beginning the presentation), the trainee stood up excitedly and declared, "That's it! I don't need to see any more! This is the tip I've needed for years." And with that, she promptly, and straightly, walked out the door! *Minitab Advanced Tips and Tricks is one of our regular webinar presentations. To see which free webinars are available this month, click here.